Introduce yourself to Jesus by studying his conversations with different people in John's Gospel. It’s only when you sit down and talk with someone that you start to discover what they are really like. What would it be like to have an intimate conversation with Jesus? What would you ask Him? What might He say to you? In his Gospel, John records for us a series of conversations that Jesus had with different people. They include a confused minister and a desperate woman; a lifelong loser and an anxious politician. From each conversation there emerges something new about Jesus – who He is, what He came to do and what His priorities and concerns are. And each time we also hear Jesus speaking directly to us. He addresses our doubts and our desires, our fears and our failings, our sorrows and setbacks, and challenges us to think differently about God, life and eternity. Use these studies to deepen your understanding of Jesus Christ, or perhaps even to be introduced to Him for the first time. It's great to order from a company that has the product you want, at a decent price and sends it quickly to you. Can't ask for more than that. Will definitely use them again. A group of elderly long time Christians have been using this book to refresh our knowledge of John's Gospel. We have found looking at conversations which Jesus held to be a helpful exercise. Some of the sessions have been full enough for them to last over two meetings but some have not been so deep as to encourage us into more discussion. However, as a group exercise this has been good because it has stopped us from airing too many bees in our own bonnets and to consider other views of Jesus and his communications with others. We feel more able to communicate with him ourselves in study and prayer. Our groups are really enjoying this series. In such a familiar gospel Tim Chester gives a very fresh approach. It's personal and well applied and always points to Jesus as the only source of true satisfaction. Studies are a little shorter than others in the series, which leaves more time for prayer. These studies follow the standard format of starting with an ice-breaker followed by the study. However, they are not always successful in coming back to the original question. The teaching in the studies is as excellent as might be expected from the author but probably more suited to a study with a Christian group rather than enquirers. Some questions require relatively brief answers and for some it is difficult to see where they fit in with the thrust of the study although the notes at the end are helpful. Some studies are long, as John is quite discursive e.g. in his description of Jesus' discussion with the woman at the well. Of course there are also massive theological points made in these chapters which cannot receive detailed treatment. Overall a reasonable balance is struck between detail and seeing the overall structure of the passage in question. As with all such studies there is good material here but it probably should be viewed as a primer of material and the bible study leader format their own study using their selection of questions best suited to their group from the material provided. After some of the other studies we have done we are all finding this a little basic, with simpler questions. I feel it is excellent for new Christians just starting on their road of discovery but this doesn't mean we don't have great discussions within our group. Like all the Good Book studies it is very solid in its approach to studying the Bible and have no hesitation in recommending it. I bought several copies of a Bible Study/discussion series for new Christians, and we have yet to start the actual studies in our group----so I cant tell how it will go down, but am expecting great things. The tone seems very accessible and not too preachy. Regarding the process of ordering and receiving the order, it all worked perfectly and in good time. I have no complaints or criticsm. The studies are well structured, with an ice-breaker at the start, the material broken down into manageable chunks, and with time to let the "word" and its meaning sink into individual hearts. Often one is reading familiar passages but because we the material is so carefully paced, the word does penetrate my heart and I believe those of others in the group. The questions invariably demand real attention and point to the hidden truths embedded in the scripture. I used these studies with a group of about 10-15 adults - both committed christian, newcomers and people unfamiliar with the christian faith, both middle class and working class people. So a rather mixed bag. Because of the introducing talkabout question which is strongly tied to the goal of the study, this booklet turned out to be a happy choice, as it is aiming for the heart and invites people to probe the Word. I think it is an excellent intro to the christian faith because of the strong focus on Jesus. We used the Gospel of John video as a means of additional communication means and then read the scripture portion as well. A word of caution: I think the studies tend to be quite long, so I usually made a selection of the material. The Leaders guide gives excellent background material and helps you to stay on track, so that the message is clearly conveyed without you as a leader to be preachy. Using this for our 1st ever Bible study group and enjoying it. Lots of help for leader and the questions are helping us to talk about our faith as well as the story. We are a group of 6/7 over 55s from different churches in a Team and all have our own book. Its good that we can prepare beforehand and fill in some answers/ideas/questions before we meet together. I have found this series a good source of material for our home group bible studies. 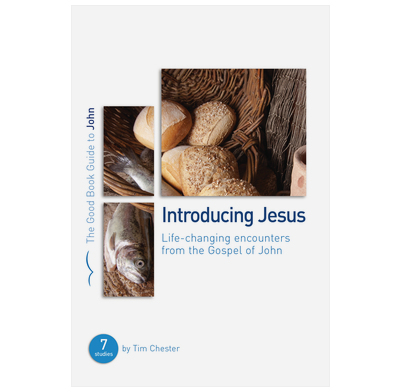 This is now the fourth in the series which I have used - the others being 1 Peter, 1 John, and the Apostles' Creed - and Introducing Jesus is another excellent example of a good choice of subject and questions appropriate for a church small group.